Carrement Beau is a new kids’ designer clothing brandname that was established by the world-wide known Groupe CWF Company. The clothes and accessories of the brand are oriented on boys and girls alike and are suitable for children aged from 2 to 12 years. This brand is characterized with the romantic touch of the capital of fashion – Paris. It combines nostalgia and contemporary trends. Carrement Beau offers luxury and high-quality toddlers, infants and children clothes made from premium-quality materials and available in different styles ranging from contemporary to retro ones. The kids clothes of the brand are available in different colors and color combinations. They are characterized by smooth lines and a poetic touch, which is a valuable part of the production process. The designers of Carrement Beau do their best to ensure high quality and durability of every item of clothing for young fashionistas who want to look stylish at any event. 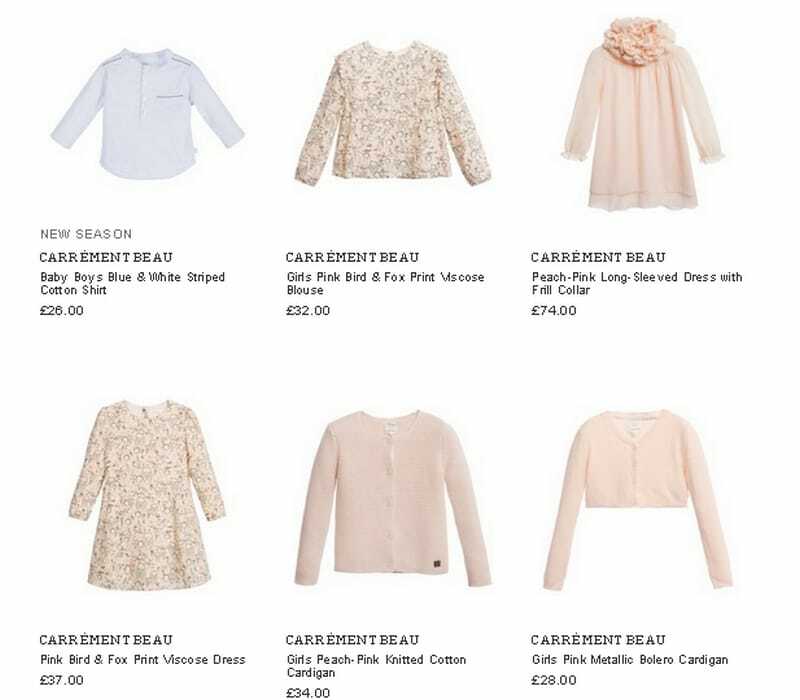 Carrement Beau is for those who value fashion, style and design in children wear collections. Carrement Beau was established in 2015. It is the third fashion brand created by a famous French company Groupe CWF. Their previous collections of clothing for boys and girls had a great success. The director of the company, Emilie Gaulupeau, decided to establish one more brand of children’s fashion. The newly established brand Carrement Beau incorporates an innovated French style with a touch of nostalgia and slightly modern twist. The fashion brand was originated in Paris, but has long gained popularity in many other parts of the world. It is a classic, vintage and very promising children clothes trademark whose designers took inspiration in a truly bohemian style. There is nothing boring about the kids clothes presented in the collections of Carrement Beau. The kids’ wear collection reflects the name of the brand that is translated as “so beautiful”. The brand was immediately recognized for its elegant design, top quality and reasonable prices. Carrement Beau is oriented on young fashionistas who have a good taste in fashion and want to express their own individuality. The fashion brand Carrement Beau employs only experienced fashion professionals offering a playful mixture of modernity and retro style. The clothes of the brand are elegant and made from the finest fabrics that are characterized by soft colors, such as white, pink, blue, red and some others. This is a truly romantic collection oriented on both boys and girls, but the girl’s collection has a special flair. Every girl dreams to wear such clothes. Each item of clothing is filled with delicate details such as beautiful belts, detachable collars and playful ruffles. The clothes are decorated with various patterns and small pockets that will come handy if your kid likes to keep some valuables at hand. As for the boys’ clothing, Carrement Beau it is truly exclusive and characterized by traditional shapes and well-thought finishing. The Carrement Beau brand provides a huge variety of kids clothing for everyday and special occasions for toddlers, infants and teens. The beautiful looks make every piece of clothing an ideal choice for special events. At the same time, there are many kids clothes that can be worn on a daily basis. What is more, Carrement Beau takes care of the children’s comfort and coziness. The exquisite children clothes provided by the brand are easy to take care of and clean. The girls’ and boys’ collections are characterized by a sweet romantic touch that reflects the best features of the Parisian fashion. You child will surely enjoy wearing the Carrement Beau outfits as they are not only beautiful and stylish, but also comfortable and light. You have a lot to choose from as the collection of the brand bristles with clothes of various shapes and colors. Carrement Beau is an ideal choice for every little fashionista.